One of the challenges i always face when adding a site column of type Choice, is how i can allow non-site admin users to be able to manage the Choice site column's Choices? for each site column of type Choice, to create a custom list for it. Users will be adding items inside the list, and these items will represent the choices for the related site column. then using a timer job or a scheduled console application, i can write some code which will retrieve all the list items and add them as a choices inside the related site column . is my above proposed appraoch a valid way to follow? what are the options i can follow to allow non-site admin users to manage the site columns of type Choice ?? 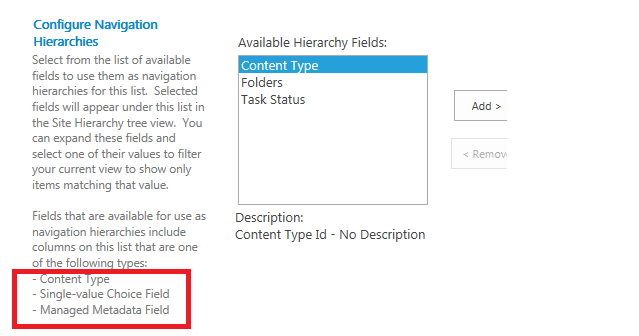 In my opinion, you should use Managed Metadata fields instead of Choice fields. Then you could set Submission Policy to Open for target term set which would allow end-users to modify possible choices. If you don't want to use Managed Metadata fields, I think that your approach is good, but instead of using timer job/scheduled console application, you can use event receiver. Then all changes would be reflected immediately. Another option would be creating some custom application page/web part to manage choice fields, but this would involve more work. Agreed with Managed Metadata Choice Field suggested by @Paweł Hawrylak . Option 2: To use a option in the choice field "Fill-in" choice and set it to Yes. The users will be able to submit their own values plus the option provided already to them . Not the answer you're looking for? Browse other questions tagged 2013 development csom site-column choice-field or ask your own question.